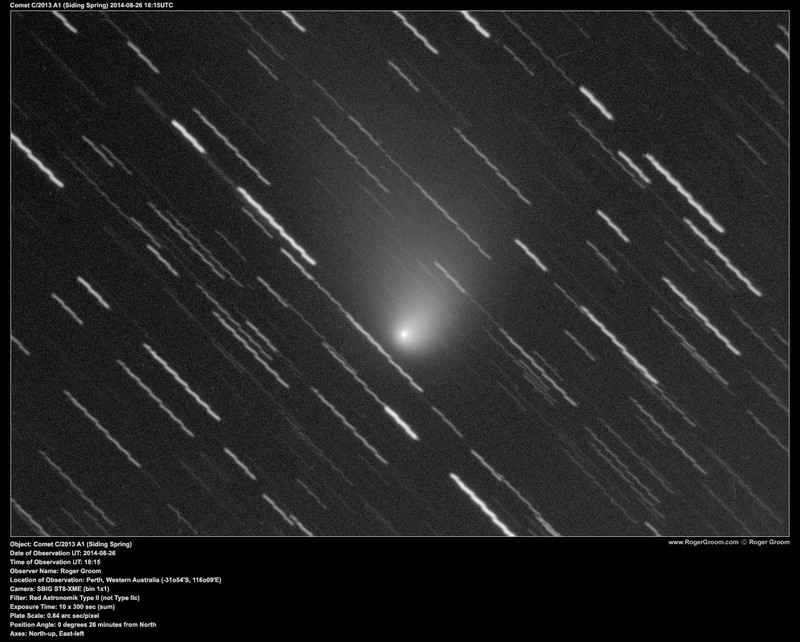 This page contains photographs of the comet C/2013 A1 (Siding Spring) taken with my 12″ SCT telescope from Perth, Western Australia in the southern hemisphere. 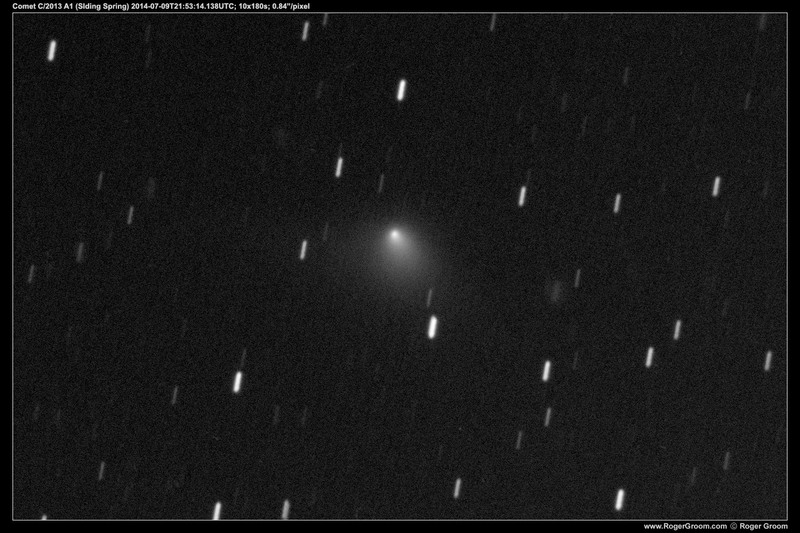 The comet C/2013 A1 (Siding Spring) is predicted to transit very close to Mars in October 2014 (October 19th & 20th), so close that if it were Earth it would be well inside the orbit of our Moon. 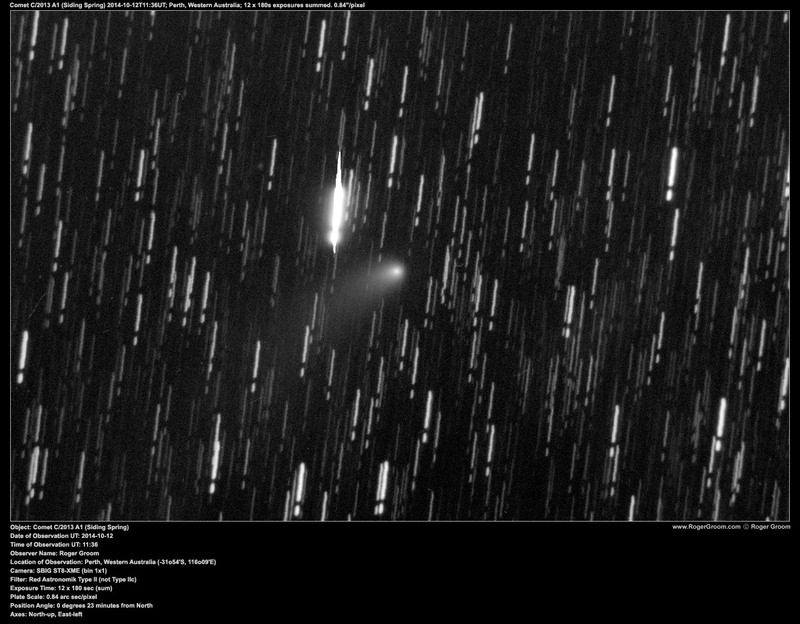 This is a unique situation and so astronomers are paying particular attention to Mars and the comet in the lead up to this event. You can find out a lot more about C/2013 A1 (Siding Springs) and it’s passage past Mars at the wikipedia article. 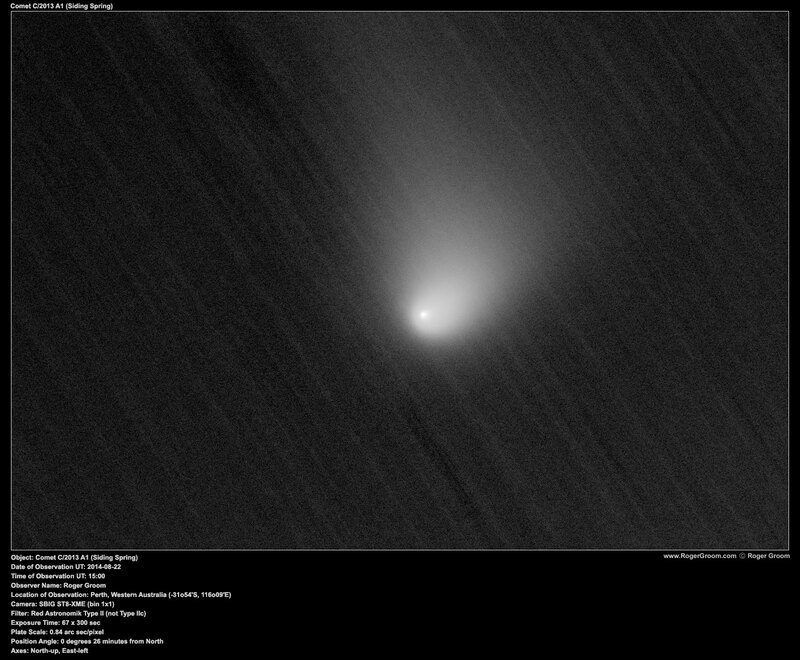 And no, the comet is not expected to hit Mars. 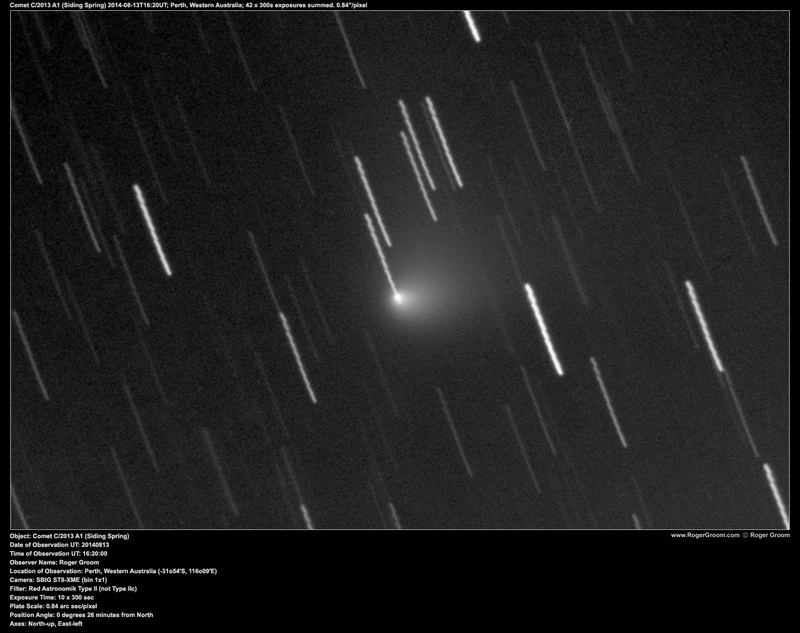 I photograph comets on a regular basis using automation scripts. 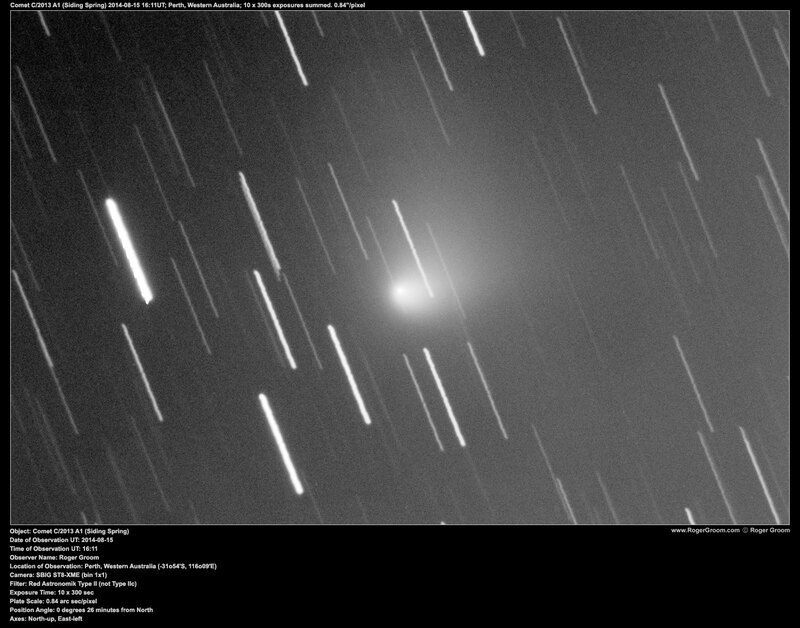 The scripts are run on any clear night that I have my observatory open. 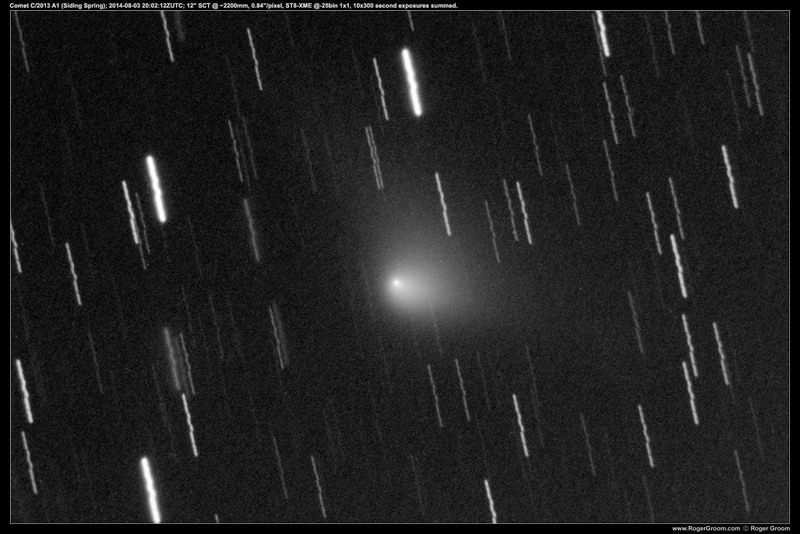 During June, July, August and September 2014 C/2013 A1 (Siding Springs) is in a good part of the sky for observations from the southern hemisphere. 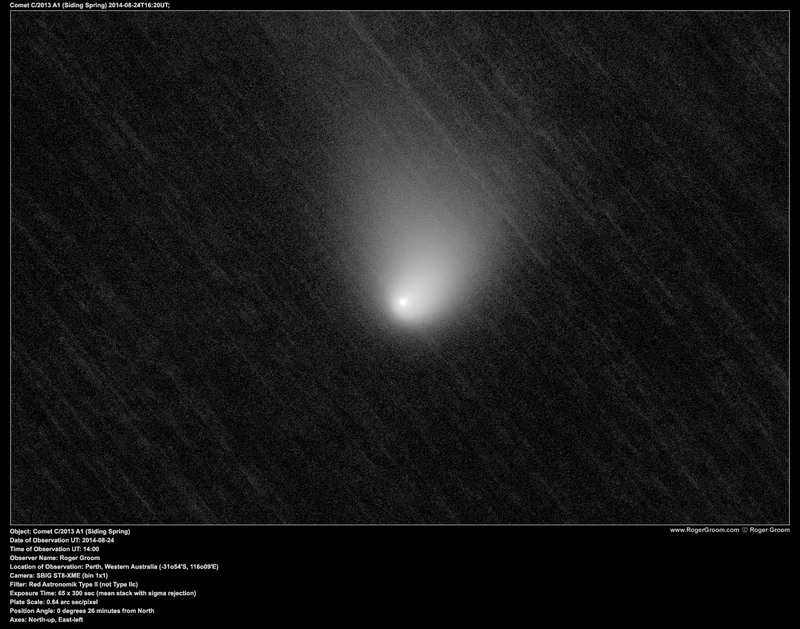 The comet rises in the south-eastern sky before midnight and before dawn is of good high altitude for photography before the Sun starts to lighten the night sky. 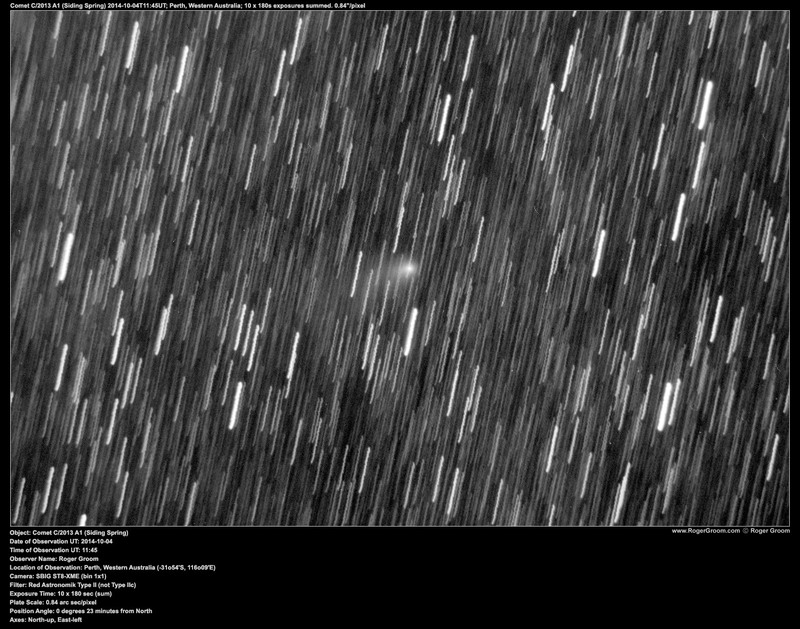 My automation scripts which track the comet at the theoretical comet tracking velocity mean that my images can be easily 300 seconds in length and show no comet nucleus trailing. 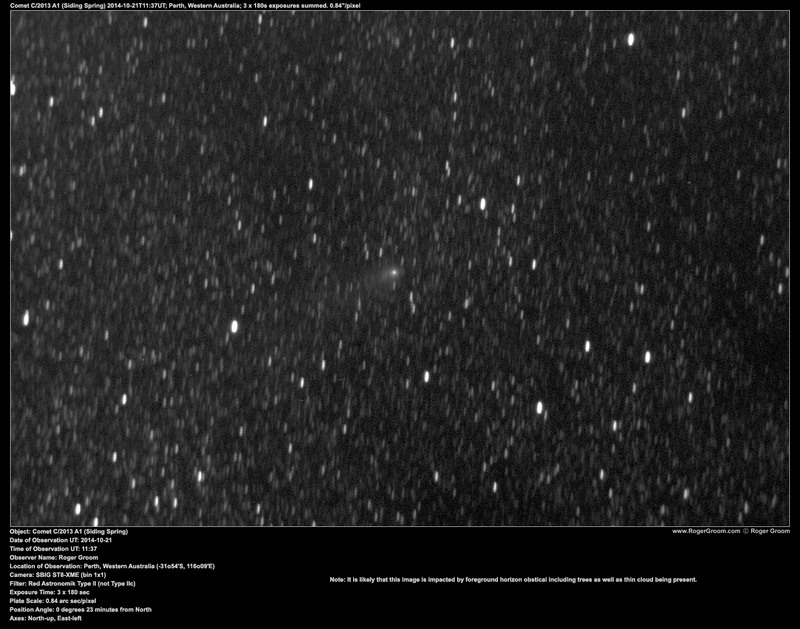 It has taken some time to develop these scripts but they are working well in particular for this comet, allowing deeper exposures (longer) which show more peripheral detail of the comet when the comet is at it’s highest altitude late at night (or early morning) when I much prefer to be sleeping than awake. 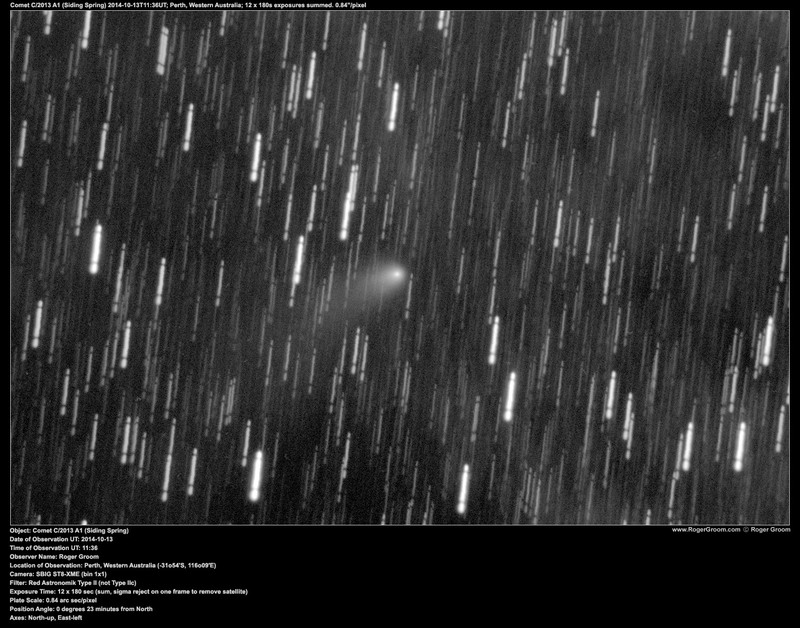 These comet tracking scripts rely on the custom tracking rates functionality of Software Bisque’s TheSkyX software and of course CCDCommander. Filter: Astronomik Type II Red filter. 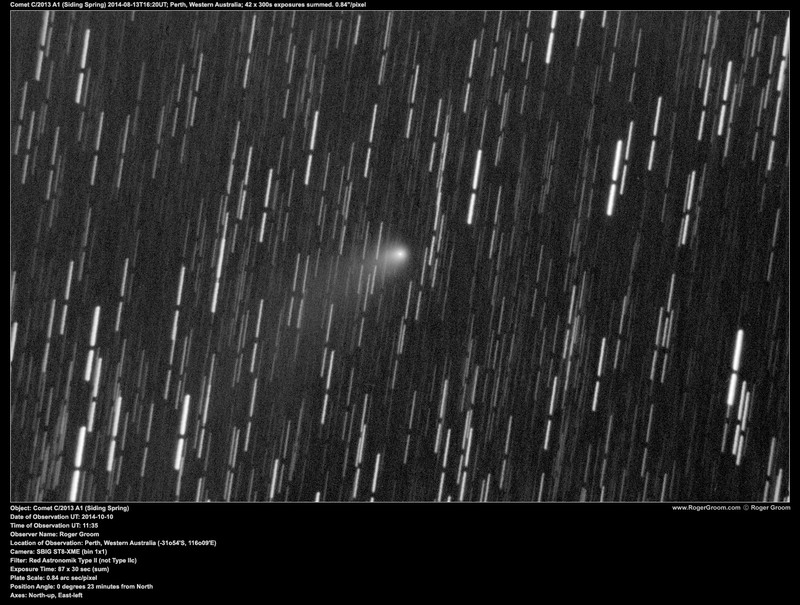 Comet C2013 A1 Siding Spring from Roger Groom on Vimeo. Likely impacted by trees towards the end of exposures. Likely impacted by thin cloud and trees to some degree. 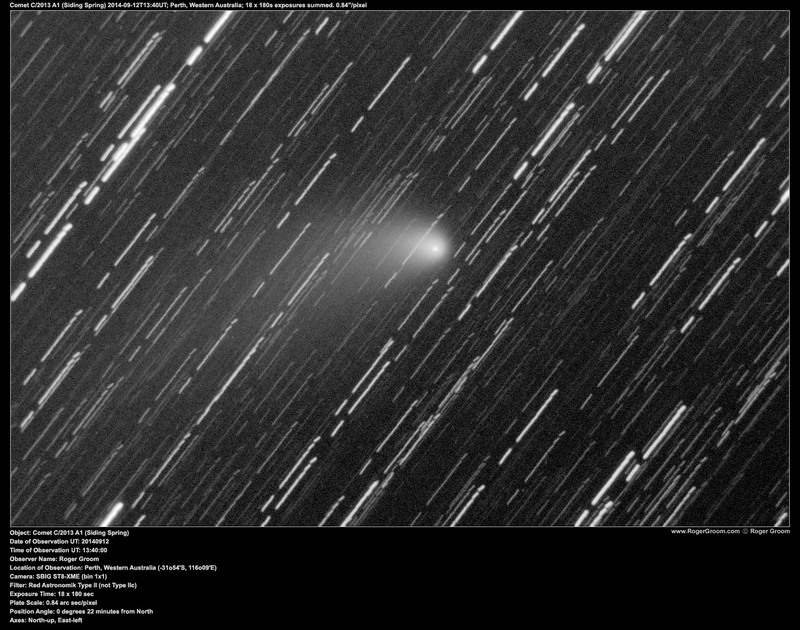 The photographs above this point are from after he comet C/2014 A1 (Siding Spring) passed close to Mars on the 19/20th October 2014. The pair are setting early in the west which has meant for decreased number of exposures. As such the quality of the above photographs cannot be directly compared to the below photographs which contain more sub-exposures. 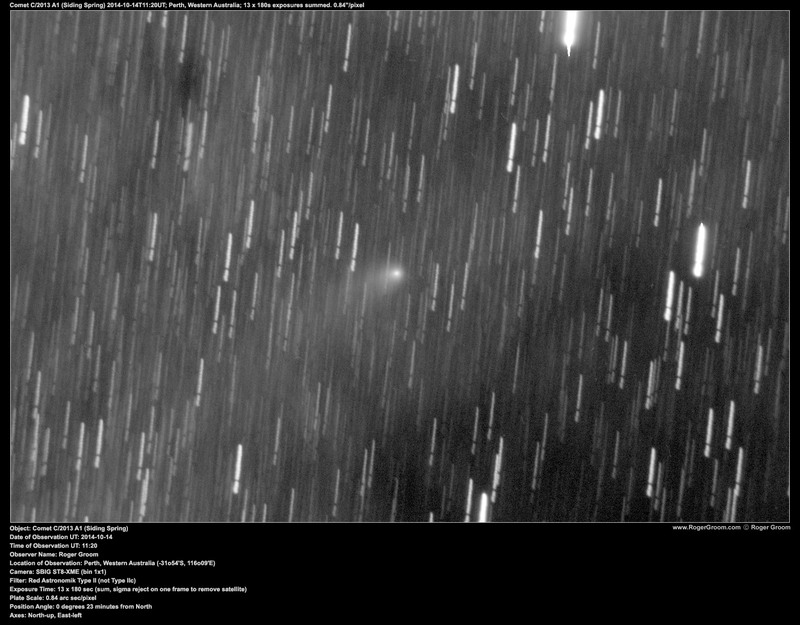 As the comet continues away from Mars after close approach it appears to be continuing to fade. 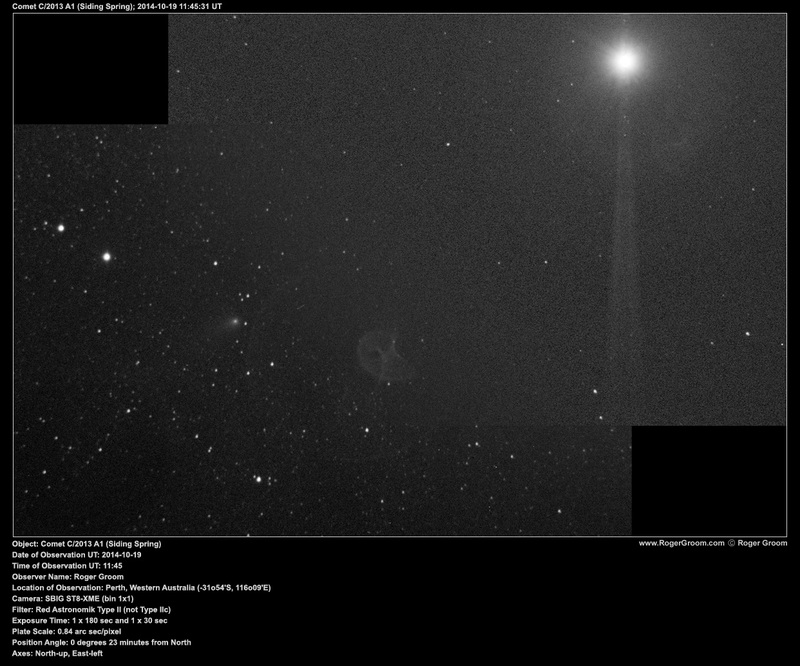 Processing notes: Mean combined 67 exposures with sigma reject to assist with removal of stars. Processing performed by Toni Scarmato. Processing by Toni Scarmato, Photography by Roger Groom. This is a median stack which has had gradient removal applied via DBE in PixInsight. 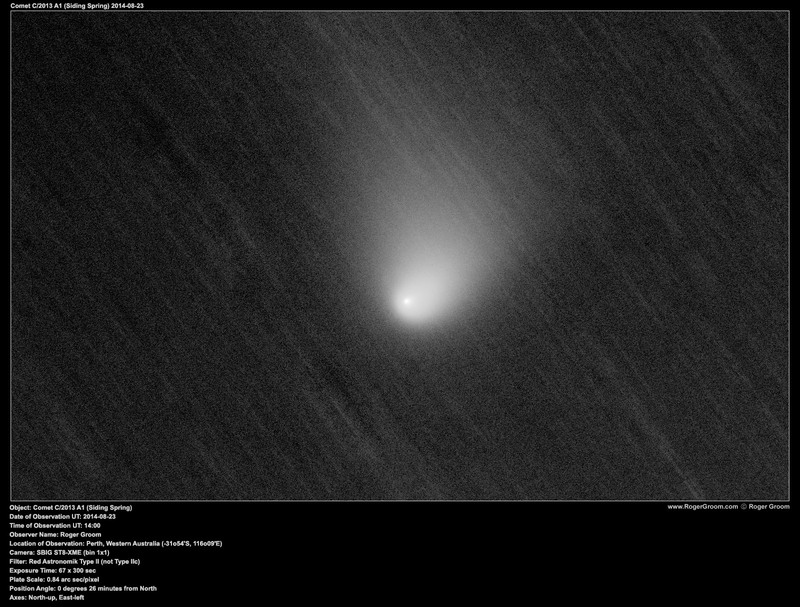 As such there is chance the outer reaches of the comet have been affected by gradient removal. Axes: North-up, East-left Note: Impacted by 92% moon phase and cloud. 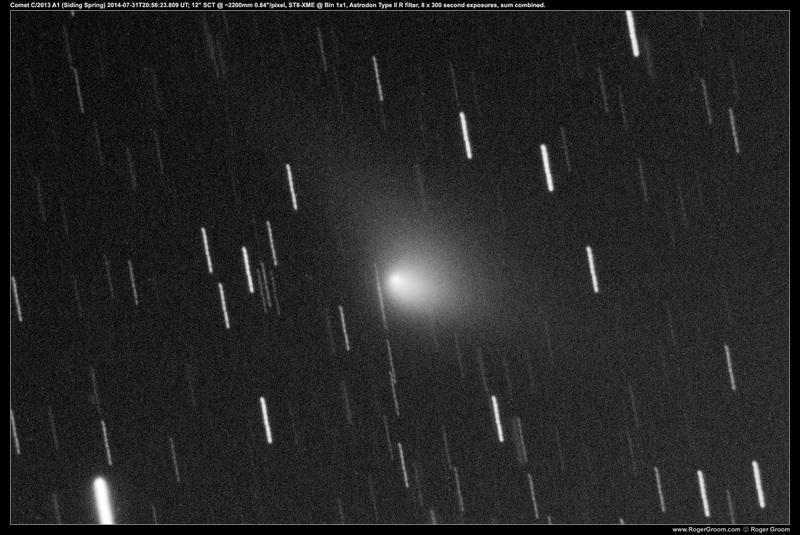 Comet C/2013 A1 (Siding Spring); 2014-08-03 20:02:12ZUTC; 12” SCT @ ~2200mm, 0.84”/pixel, ST8-XME @-25bin 1×1, 10×300 second exposures summed. Processing by Toni Scarmato, photography by Roger Groom. 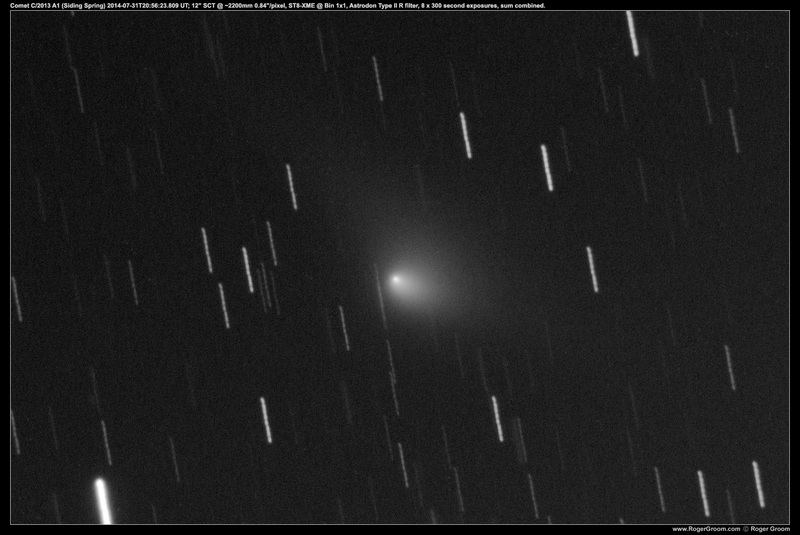 Comet C/2013 A1 (Siding Spring); 2014-08-03 20:02:12ZUTC; 12” SCT @ ~2200mm, 0.84”/pixel, ST8-XME @-25bin 1×1, 10×300 second exposures summed. 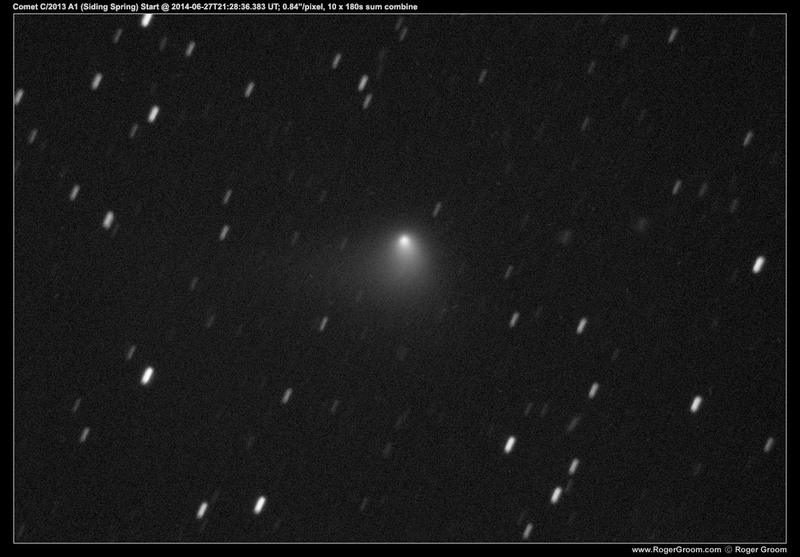 Comet C/2013 A1 (Siding Spring); 2014-08-01 UTC; 12” SCT @ ~2200mm, 0.84”/pixel, ST8-XME @-25bin 1×1, 10×300 second exposures summed. Photography by Roger Groom, processing and analysis by Toni Scarmato. 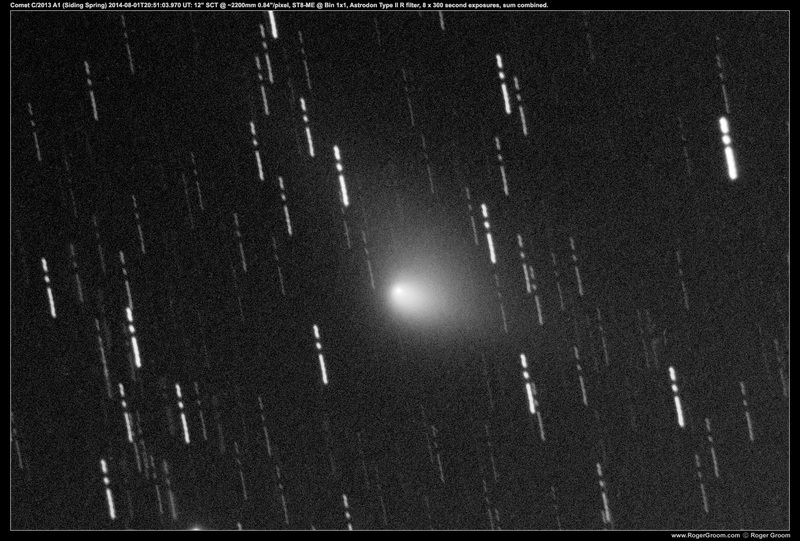 Comet C/2013 A1 (Siding Spring) 2014-08-01T20:51:03.970UTC Start; 12” SCT @ 2200mm, 0.84”/pixel; ST8-XME @ bin1x1, -25c, 8×300 second exposures summed. Processing by Toni Scarmato, photography by Roger Groom. 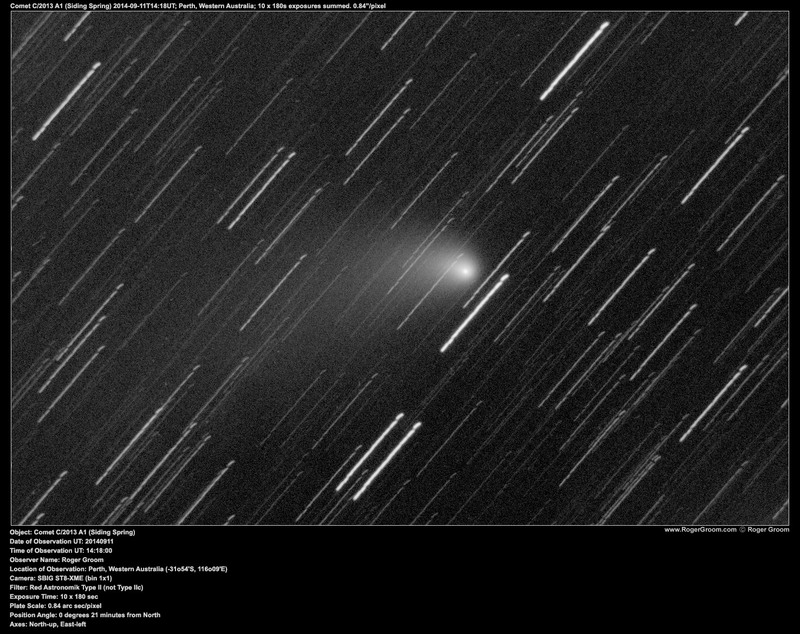 Comet C/2013 A1 (Siding Spring) 2014-07-31T20:56:23.809UTC Start; 12” SCT @ 2200mm, 0.84”/pixel; ST8-XME @ bin1x1, -25c, 8×300 second exposures summed. 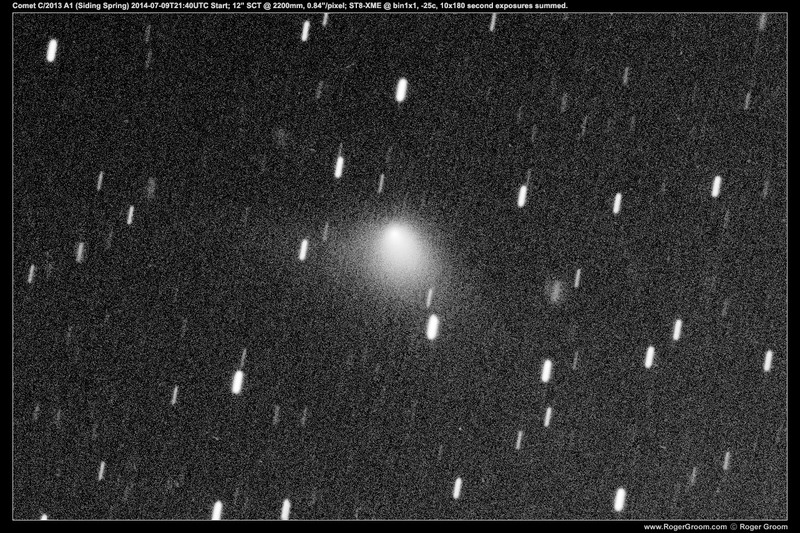 Comet C/2013 A1 (Siding Spring) 2014-07-31T20:56:23.809UTC Start; 12” SCT @ 2200mm, 0.84”/pixel; ST8-XME @ bin1x1, -25c, 8×300 second exposures summed. Comet C/2013 A1 (Siding Spring) 2014-07-09T21:40UTC Start; 12” SCT @ 2200mm, 0.84”/pixel; ST8-XME @ bin1x1, -25c, 10×180 second exposures summed. Astornomik Type II Red filter used. 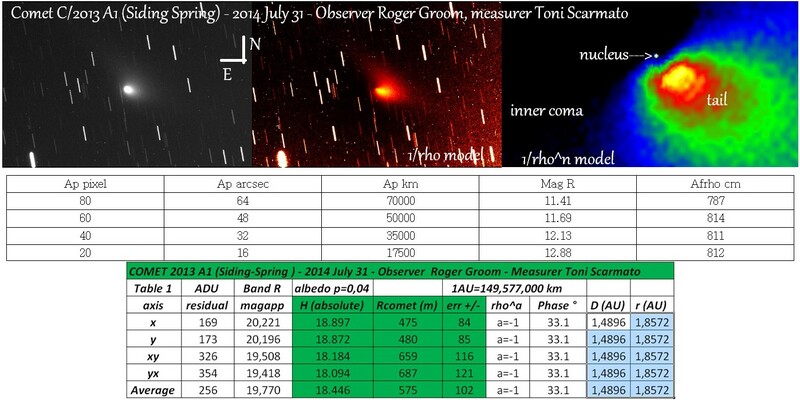 Processing and analysis by Toni Schamato. 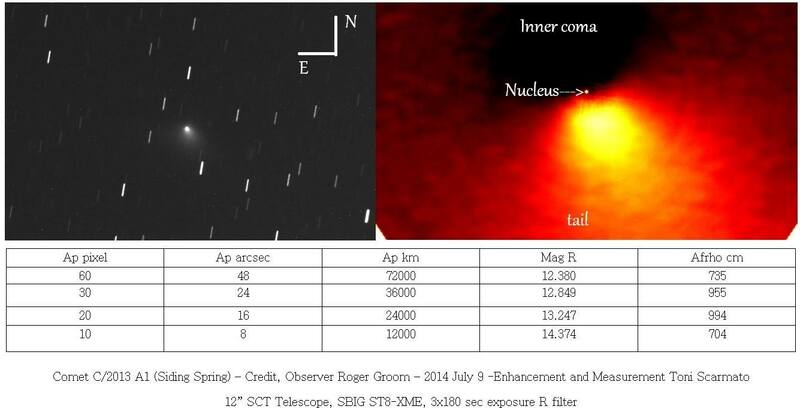 This image shows the Inner Coma, Nucleus and tail of the comet along with magnitude estimations. 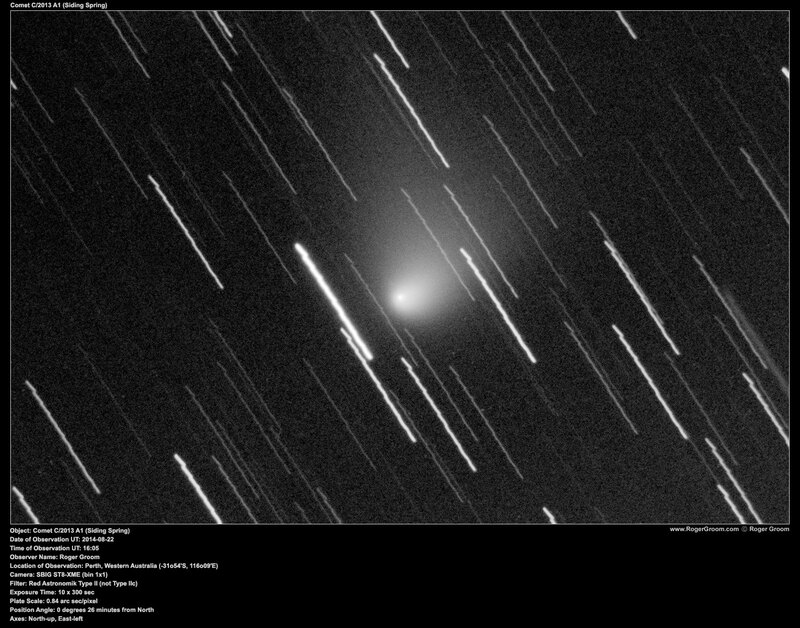 Comet C/2013 A1 (Siding Spring) 2014-07-09T21:40UTC Start; 12” SCT @ 2200mm, 0.84”/pixel; ST8-XME @ bin1x1, -25c, 10×180 second exposures summed. (brighter, cropped). 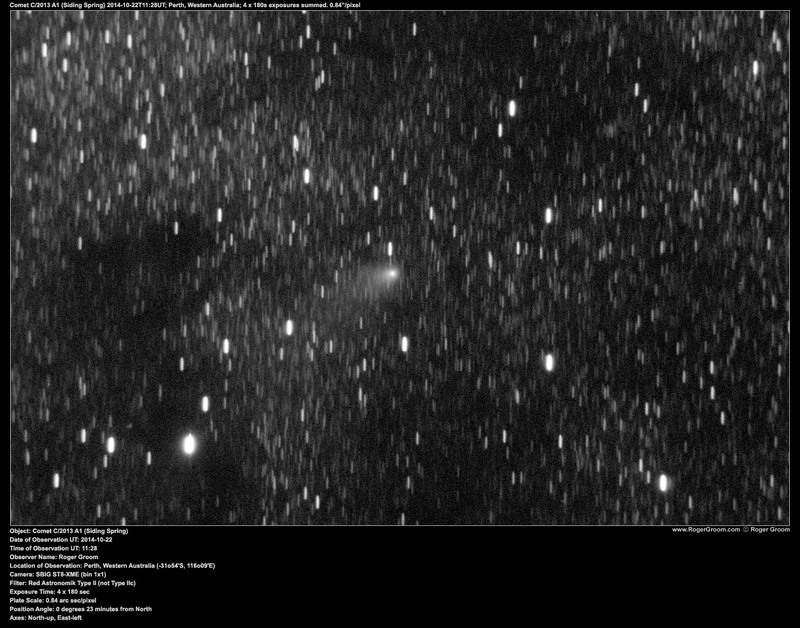 Astronomik Type II Red filter used. 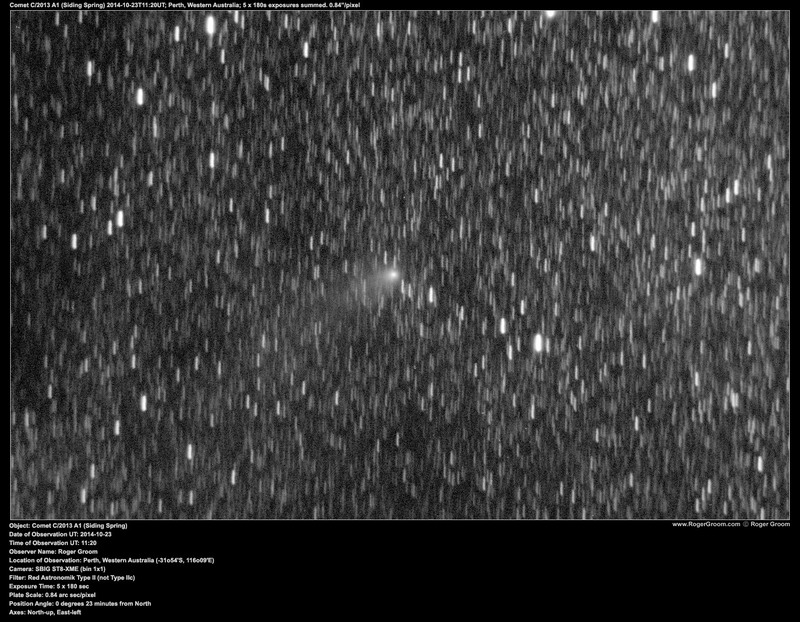 Comet C/2013 A1 (Siding Spring) 2014-07-09T21:40UTC Start; 12” SCT @ 2200mm, 0.84”/pixel; ST8-XME @ bin1x1, -25c, 10×180 second exposures summed. (brighter). Astronomik Type II Red filter used. 12″ SCT @ 2200mm, 0.84″/pixel. 10x180s exposures summed. Astronomik Type II Red filter used. 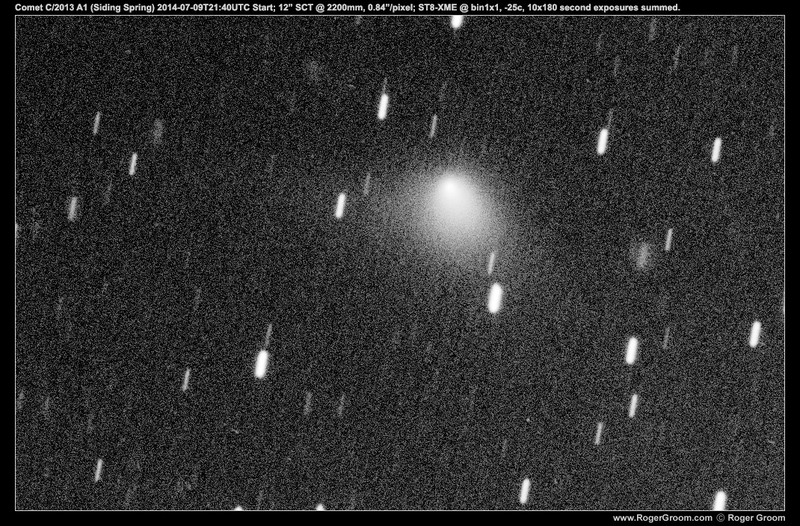 Comet C/2013 A1 (Siding Spring) at 2014-06-27T21:28:36.383 UT. 10 x 180 second exposures combined using sum algorithm. Cropped from full frame. Clear (no filter).